RITTER Drum-type (wet-test) Gas Meters are universally applicable for measuring the volume of flowing gases and are particularly effective when measurements demand the highest precision. The possibility of selecting the gas meter material from among 5 different excellent materials enables the user to meet measurement requirements even in cases of highly aggressive gases. Additionally, for rugged and industrial applications, robust models with a stainless steel casing (1.4571) and plastic drum (four different materials) are available. The desired measurement range can be selected from among 8 sizes (types) extending as a whole from 1 Ltr/h to 18,000 Ltr/h at a gas temperature ranging from -10 °C to +80 °C. The solidly manufactured casing of the standard meters is designed to withstand a maximum overpressure of 50 mbar (plastic casings) or 500 mbar (stainless steel casings); meters for higher pressure ranges up to 40 bars are available. 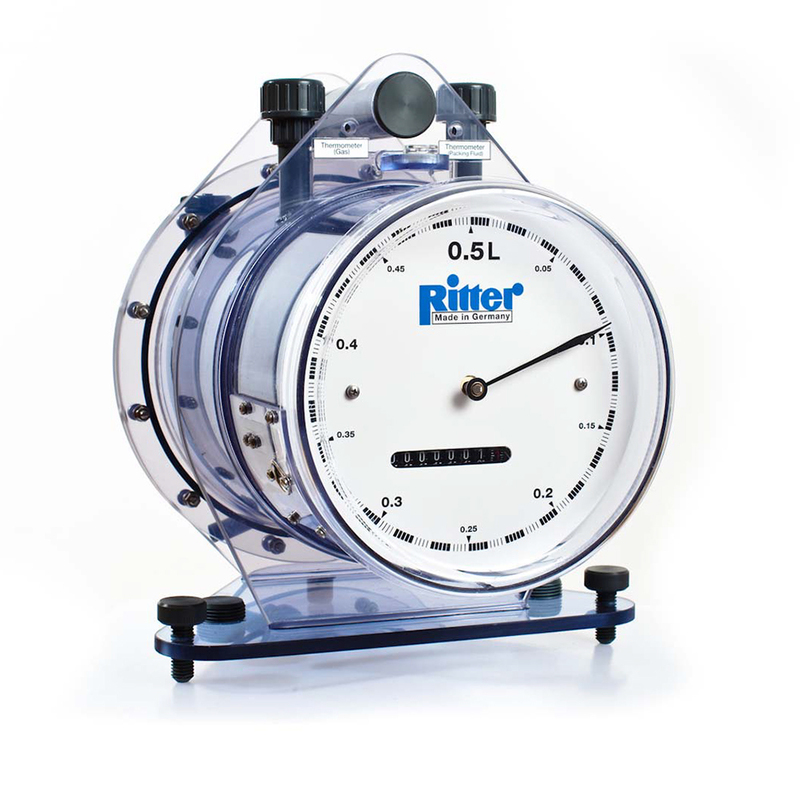 The measurement of RITTER Drum-type Gas Meters works on the principle of displacement. The gas meters contain a revolving measuring mechanism (measuring drum) within a packing liquid (usual: water or low-viscosity oil). The measuring drum compulsorily measures volume by periodically filling and emptying four rigid measuring chambers. Fastidious production methods and calibration enable a measuring accuracy of ± 0.2% at standard flow rate and approx. ± 0.5% over the whole measuring range. The major advantage and the superiority of volumetric gas meters (like drum-type gas meters) over other measurement principles, which determine gas volume using secondary measurable variables such as speed, heat capacity, hot-wire resistance or similar, is the direct measurement of volume. That means that the condition and the composition of the gas have no influence on the measurement accuracy. Correcting factors which take into account gas type, temperature, humidity etc are therefore not necessary. It should be noted that with other, non-volumetric measurements the accuracy given for that measurement can only be achieved if the correcting factors for the actual gas condition or gas mixture are exactly known.